Combines the functions of a sleek mouse pad and a mobile phone stand and wireless charger. Up your multi-tasking skills by charging any Qi-enabled device while using your computer. Aluratek's Qi Wireless 10W Charging Mouse Pad combines the functions of a sleek mouse pad and a mobile phone stand and wireless charger. Up your multi-tasking skills by charging any Qi-enabled device while using your computer. You no longer have to worry about leaving your desk with a dead device. 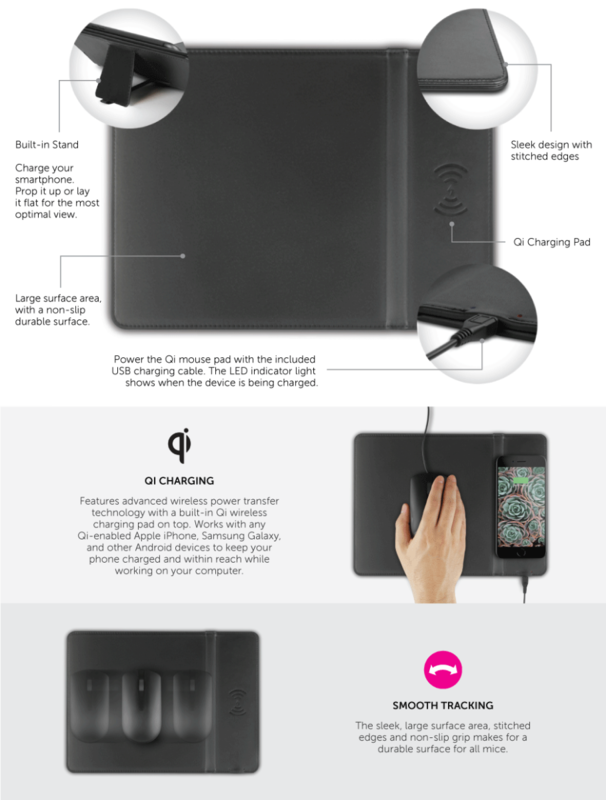 Simply place your Qi-enabled device on the Qi charge icon and the Qi charger begins charging your mobile phone instantly. The functional built-in stand allows for comfortable viewing, so you don’t have to worry about missing important calls or texts while waiting for your device to charge. The large surface area, smooth tracking surface and stitched edges makes the wireless charging mouse pad a durable surface for gamers. Never again will your game be interrupted by a text or phone call, your charging device is within your fingertips for easy access. A versatile mouse pad that combines the functions of a non-slip mouse pad, mobile phone stand and Qi Wireless Charger. The Qi Wireless 10W Charging Mouse Pad features advanced wireless power transfer technology with a built-in Qi wireless charging pad on top. Works with any Qi-enabled Apple iPhone, Samsung Galaxy, and other Android devices to keep your phone charged and within reach while working on your computer. Featuring a built-in mobile phone stand, charge your device with the option of propping up your device or lay flat for the most optimal view of your phone. Never miss an important text of phone call while waiting for your phone to charge. The LED indicator light shows when the device is being charged. You’ll never have to question if your mobile device has enabled the charging pad. The sleek, large surface area, stitched edges and non-slip grip makes for a durable surface for all mice. 11.75 x .25 x 8.625 " (30 x .64 x 22 cm) / 9 oz.